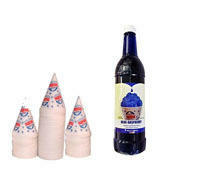 Add your sno kone syrup and serving cups here... 25 servings for just $6. Please specify 1 flavor choice for each 25 servings when ordering: select from cherry, blue raspberry, and lemon-lime. Remember, you'll need to provide the ice for the snow cones.